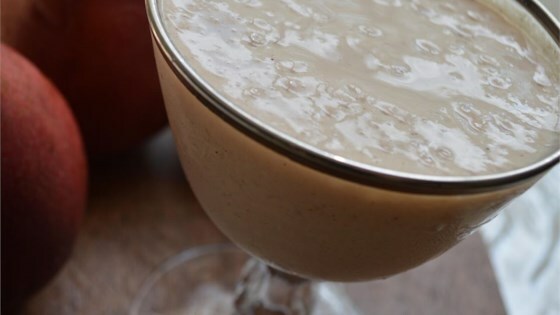 "I've always loved the combination of cinnamon and pears; toss in a banana, some milk and a few other things and you've got a delightful breakfast drink. If you have the foresight to freeze the banana chunks ahead of time, this is even more refreshing." Place the pears, banana, milk, yogurt, cinnamon, and nutmeg into a blender. Cover, and puree until smooth. Pour into glasses to serve. Very tasty and refreshing. The only difference my boyfriend and I made was that we used frozen bananas and soy milk instead of regular. Overall a definite make again.